When visiting a place like Spiti Valley in 12 days, you are making sure of two things. The first and foremost is that you do not spend all the time on the road. With 12 days in hand, your daily travel time will be strictly limited to 4-5 hours a day; thus allowing you plenty of time for sightseeing and visiting every place that is worth visiting en route. Second is that you will not tire and exhaust yourself on any of the days. There is no denying the fact that Spiti valley is still a highly remote region and notorious for its bad roads. Traveling on bad broken routes for long hours everyday will just stress you out in the end; and rather than focusing on enjoying your trip; you will be more focused on reaching the destination and checking into a hotel. Another reason could of traveling by public transport. By your own vehicle, you can rush through the journey in a lesser amount of time. But when you have to rely on a government bus or shared taxis; you cannot really follow a strict timeline. You will have to keep a buffer of a few days to ensure that in case you ended up missing your bus; or did not find any sort of commute from one place to another; then you can afford the delay of a day or two. I am not saying that you cannot complete the journey with a lesser number; but 10 to 12 days is what I usually recommend people as an ideal time for Spiti valley trip. In this particular article, I will provide a sample itinerary that you can follow in order to visit Spiti in 12 days. First thing you need to pay close attention to when visiting Spiti is the route you want to take to get there. This will depend on the time of your travel and your own riding or driving skills. Of the two roads leaving to the valley; the one via Shimla is considered as comparatively easier. Reason being that there is no high altitude pass in between. Starting from Shimla, you gradually climb up and gain altitude, thus allowing your body plenty of time to acclimatize. And because there is no pass en route, this road also remains open for all 12 months a year. There could be occasional road blocks caused by incessant rains or too much snow; but authorities usually clear the road as soon as they are able to and restore connectivity. With that being said, this is also the longer of the two roads. A journey from Shimla to Kaza can easily be over 500 kilometers; and will be at least 2 days long; depending on the places you visited on the way. On the other hand, coming from Manali side, you can reach Spiti valley in a matter of few hours. Manali – Kaza route is about 200 kilometers long; doable in a single day; but will also take you across two high altitude passes, Rohtang and Kunzum La; both of which are notorious for receiving high amounts of snow each year due to which, this road is open only from late May to early October. So while deciding on the route, you will need to factor in whether or not the Manali Kaza route is open; and if it is, then will you be able to drive or ride through it. Keeping this in mind, I will suggest three different type of itineraries below. First one will have you travel on the entire circuit; starting from Shimla and ending at Manali; but can only be done when both Kunzum and Rohtang are open for vehicular traffic. Second itinerary will both start and end at Shimla only. This can be followed throughout the year irrespective of the month of your trip. Third and last itinerary will exclude the Shimla road entirely and will only focus on completing the journey from Manali side. For the sake of this article, I will assume that you are staring from Delhi. If you were coming from a different city; then only the travel on first and last day will be different. Rest of the details for remaining days will still apply. I will first explain an itinerary that I recommend. Not much to write about this day except that this will be a long journey. Total distance covered will be about 400 kilometers in 9 to 10 hours. I will recommend staying at Narkanda rather than crowded Shimla because it will also reduce your travel time on Day 2. Road conditions will be mostly OK all the way will Narkanda. Take an early morning drive to Hatu Peak before starting for Sarahan. After visiting Hatu, have breakfast, check out of the hotel and start on your way to Sarahan. You will first reach Rampur and then Jeori. From Jeori, turn right on the 16 kilometers long road to Sarahan. Depending on what time you arrived here, you can also visit the Bhimakali temple and the bird sanctuary at Sarahan on the same day. Distance traveled will be about 100 kilometers in 4-5 hours. Road conditions will be mostly OK.
Drive 16 kilometers from Sarahan back to Jeori and then continue towards Karcham. At Karcham, turn on the road that goes towards Sangla Valley and drive about 40 kilometers to arrive at Chitkul while crossing Sangla town on the way. Travel time will be about 5 hours for a total of 110 kilometers. From Chitkul, drive back to Karcham again and then continue towards Reckong Peo. Journey on this day will be very short, just about 65 kilometers and easily doable in 3 hours at most. Road conditions will be mostly OK. After Powari, you will notice a road to your left going uphill towards Reckong Peo and then Kalpa. This is the road that you will turn on and drive about 16 kilometers on a steep narrow ascent. There are several hotels at Kalpa that you can stay at. The views of Kinner Kailash from Kalpa is definitely worth a visit here. Journey for this day will be about a 100 kilometers but will take you through some really bad roads; due to which it can easily take up to 6 hours. From Kalpa, drive down again to the main highway and then continue traveling towards Pooh. After Pooh you will arrive at Khab Bridge and then climb up Kazigs to arrive at Nako. Destination for today will be the beautiful Pin Valley but you will also be visiting several other places en route; hence I will recommend that you get a really early start. Road conditions too from here will continue to deteriorate for rest of the journey. Nako to Mud is about 135 kilometers but will easily take you 7 to 8 hours considering that you will take a few detours as well. 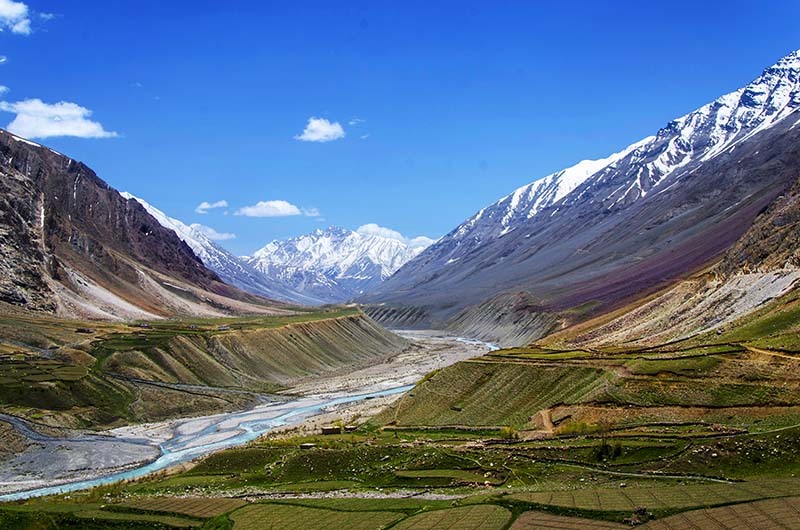 From Nako, you will drive to Giu village to see the Mummy of Spiti valley. The road to this village has been marked by a few boards and pictures of the mummy; and a large gate so you will easily spot it. After a short detour to Giu, you will then drive to Tabo and see the Tabo Monastery. Next destination will be Dhankar and after visiting the monastery here, you can also trek to Dhankar lake; but that can take you about 2 hours so plan accordingly. After Dhankar, you will then take the turn towards Pin Valley from Attargo Bridge and then drive 35 kilometers to reach Mud village; where you will be staying at for the night. In order to reach Baralacha La, from Jispa you will have to drive towards Sarchu and then further to Leh. Drive all the way to the top of Baralacha La. Suraj Taal is located at the top of the pass. Spend some time there and then start your return journey. You will again reach Jispa, then Keylong and then back to Gramphoo. After Gramphoo, climb up to Rohtang Pass and then reach Manali by evening. Also Read: How much a Motorcycle Trip to Spiti Valley will Cost? Now the itinerary above is of course just one example of how this journey can be done. Depending on your own preference, you can change this in several other ways; removing some places and extending your stay at others. A couple of other variations of this itinerary can be as mentioned below. Now all three of the itineraries above will have you traveling on the entire circuit; which also means that you can only follow it when Manali Kaza route is open. If you were however traveling in the months before May or after October, then you would have no choice but to begin your journey from Shimla; reach Kaza and then return back to Shimla again. You can also do this if you were not very confident of your driving or riding skills and wanted to avoid the Kaza to Manali road. Also Read: Why you should go to Spiti from Shimla? In this case, your itinerary can be as below. The reason why I kept Day 12 as buffer is because if you were traveling in winter season, you must keep one day over and above your itinerary; in case if snowed too much and you were stranded at any of the places en route. To be very honest, 12 days in Spiti from Manali will be a bit of an overkill. What I mean is that you will cover all of it in less than 12 days; and will have more time in hand that you will just spend relaxing at hotels. You could do that as well but I would recommend that you then make it a trip for Lahaul and Spiti; rather than just Spiti. You can pick and follow either of the itineraries below. Also Read: Why you Should Visit Spiti From Manali? The examples I shared above are just a few of many other ways that this journey can be done. 12 days is a sufficient enough time and you can add or remove many other places to your travel plan. If you were thinking of a different itinerary and need my inputs on it; please feel free to ask in the comments area at the bottom of this page. Now since we are talking about visiting Spiti from Manali side; there are a couple of important things that I must mention here. The reason why starting from Shimla is considered better for Spiti trip is because the the increase in altitude then is gradual; spread over 3 to 4 days of journey. On the other side, if you went to Spiti from Manali, your gain in altitude is sudden; without allowing enough time for your body to acclimatize. Think of it like this. One day you are in plains, at your home in the morning. By evening, you gain 2000 meters and reach Manali. The very next day, you gain another 2000 meters in height and reach Kaza at 4000 meters; while crossing 2 high altitude passes on the way. For 2 days in a row, you continue to jump elevation by double the amount; due to which, your body may go into shock, triggering the symptoms of acute mountain sickness. This happens with majority of people. After slow gain in altitude, plenty of rest is the next best cure for AMS. So while going to Kaza from Manali side, ensure that you spend at least one day in Manali; which can be beneficial in terms of obtaining the permits as well. After you reach Kaza, get plenty of rest, do not exhaust yourself and in a day, symptoms of AMS should subside. If your condition worsens, then you should seek medical attention in Kaza immediately. Another important thing you need to consider is in terms of permit required for Spiti valley. If you are an Indian citizen, then you do not really need any kind of permission specific to Spiti; but if you went from Manali to Kaza, then you must obtain a permit to cross over Rohtang Pass. This permit is a mandate and without it, you will not be able to travel to Rohtang La or beyond. This permit can be obtained either online, or in person from DM office, Manali. For more details on this permit and related charges; please read How to Obtain a Permit for Rohtang Pass. I hope the information above on visiting Spiti valley in 12 days was of help. If you have any further questions; or need any further details; please feel free to ask in the comments section below; or at our Community Forum; and I will be glad to answer.